Kitchens come in many shapes and type, so when picking the right kitchen layout for your home there are many things to consider. The layout is one of the most important aspects when remodeling or custom designing your space. With a large variety of layout options available, you may be unsure of which type is best suited for your home. Truthfully, it all comes down to allotted space, efficiency and functionality preferences. 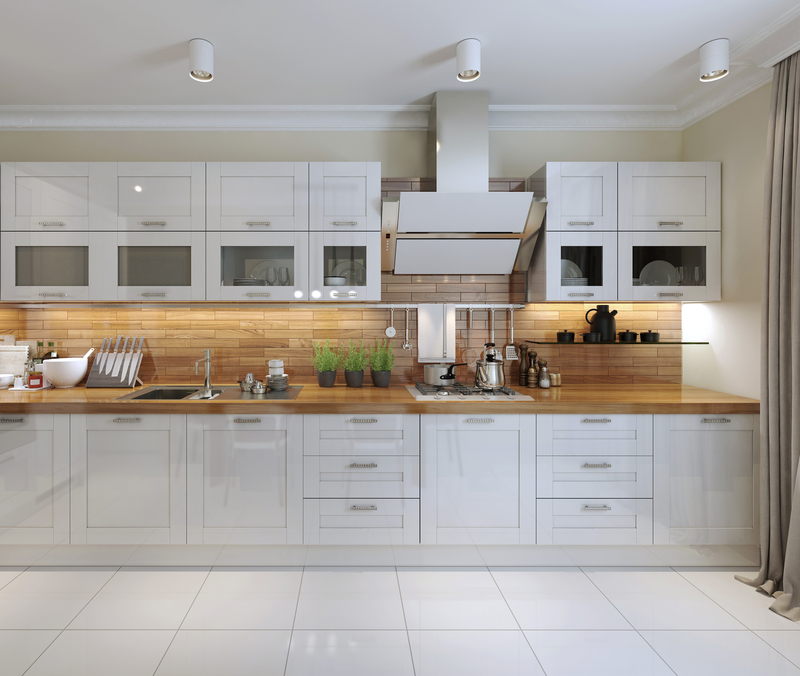 We hope the following information helps you choose the absolute best kitchen. U-shaped kitchens are a favorite among homeowners, as they are ideal for both large and small rooms. As its name suggests, this configuration creates a horseshoe-shaped work area with cabinets and counters that make up three connected walls. U-shaped kitchens generally provide maximum space for cooking, cleaning, food preparation and storage. This layout is often considered to be the most efficient kitchen floor plan because it provides a lot of open space. It is also advantageous in the sense that two or more people can cook at the same time. It sometimes includes a central island that can be used as a work space or an area for seating, creating a more social room for everyone in the home. This is a popular choice for small to medium-sized rooms because its open floor plan allows for two walls worth of cabinet space. With an L-shaped design, the shorter wall can be utilized for cooking appliances, while the longer wall can provide a spot for a sink/dishwasher and a refrigerator at its end. It also allows for the addition of an island or table. 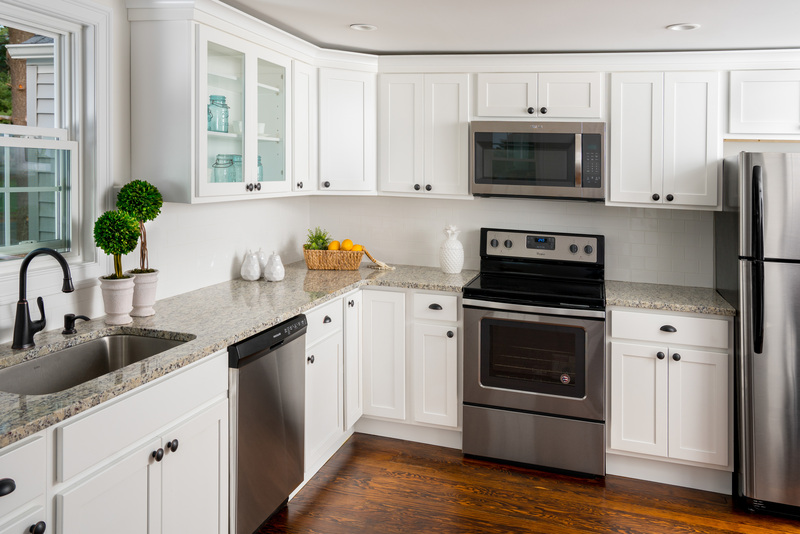 An L-shaped kitchen is usually concurrent with the  workflow triangle that allows you to move easily between your sink, oven and refrigerator. If you entertain often, this might be your best bet. A galley kitchen layout has two parallel counter tops/cabinet walls that incorporate a single traffic lane in between. It is an extremely functional design because everything is easily accessible. Galley kitchens maximize space and make for efficient cooking zones. However, it doesn't have room for a dining area and therefore limits social interactions while preparing meals. If you have a narrow room to work with, you should go with this layout. If you really want a kitchen island but don't have the space to accommodate one, you can always opt for a peninsula layout. 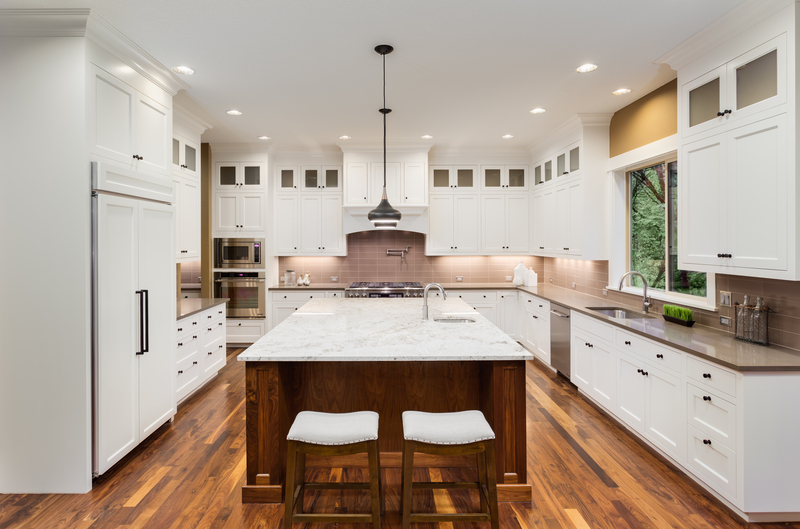 A peninsula design is similar to a kitchen island, but it's connected to a wall on one end. Peninsula kitchens offer all the same benefits of an island, as you get plenty of counter top/cabinetry space and additional storage. If you love to cook, this layout creates an optimal work triangle where appliances exits on all three sides in close proximity. This style also caters to the open-room concept. Peninsulas are a great way to create a visual divide between the kitchen and other living areas, too. The one-wall kitchen layout is known as the ultimate space saver. 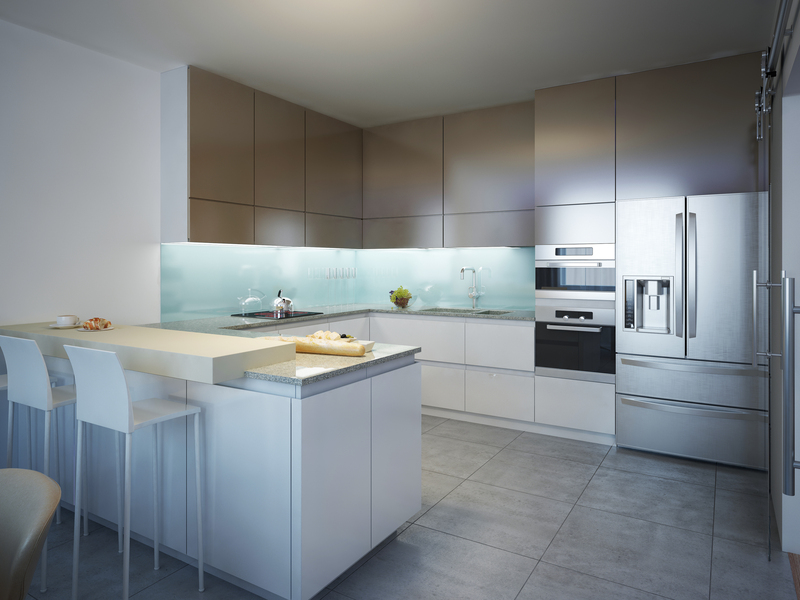 It is a contemporary and stylish option where cabinets and appliances are fixed on a single wall. This compact layout is cost-effective and creates an efficient work zone for cooking purposes. There are a variety of ways to guarantee storage space when cabinets are massed on a single wall. One straightforward approach is to add as many cabinets to that wall as possible. Tall upper cabinets, bridge cabinets and creative use of built in shelving will help maximize the space in this instance. Additionally, the use of an island (either permanent or roll-away) will help increase the amount of available storage and seating. A well-planned kitchen layout is crucial to gaining an efficient and enjoyable space. Be sure to check out our Fabuwood custom kitchen visualizer and see what our cabinet options look with the different layouts and floor plans you are considering! What is your favorite kitchen layout? We’d love to hear your suggestions and ideas in the comment section below.